Where is Summerglen? It is located in the very SW part of Ocala if 484 and I-75. It is just minutes to the Villages and Marion Oaks area. Why do people like to live here? 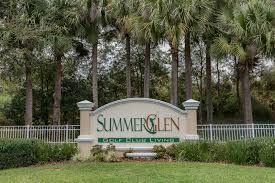 The residents love the convenience to The Villages and I-75. There is also a golf course and on site restaurant in this lovely neighborhood. Plenty to do at the clubhouse which has tons of activities and clubs available. Tell me more – This is an active 55 and better community with an HOA that helps take care of common areas, cable, trash pick up and more. For info on the golf course please contact them directly by clicking here. I want to sell my home here – I can help you with that. Please click here for a free market analysis then call me to discuss the best marketing plan for your home. I want to look at homes here. I can arrange a time to go see as many homes as you like. Just take a look at what is currently available and then give me a call.